You met her at a roadside cafe just outside of Little Rock. It was two in the morning and you were on your third cup of coffee. You’d been hitchhiking for three days without much sleep. She was a waitress and you were her only customer. She took her cigarette outside and waited for you to finish. But she kept sneaking peaks at you, and you knew it. You knew you smelled bad, and your eyes were as red as sundown, but you were polite and didn’t have liquor on your breath. You knew you looked used-up, but she saw something in you no one else did. She saw you as someone lost and looking to find a way back home. When she came back inside after her third smoke, she sat right down beside you and introduced herself. And she was bold! Asked you if you had a place to stay, and offered you a decent bed. Not to share it with her, Lord no, but she kept a small spare bedroom that was warm. You could clean yourself up before you hit the road again, and she wouldn’t mind if you did a few chores for her. But nothing funny. She kept a loaded gun in her bedroom and wanted you to know it. You were so overwhelmed – and surprised – by her kindness that you couldn’t think of a decent excuse to walk away. So she took you home and you slept in her spare bedroom in the back, next to the laundry room, and you slept for most of a day. And she was with you every day from then. Sometimes, in the deepest heart of the night, you woke up clinging to her tightly, fiercely, and you remember that same kind of fierceness as when you were holding on to a pine tree in the middle of a rain storm, that deepest heart of that deepest night. And you swore you’d never let go. 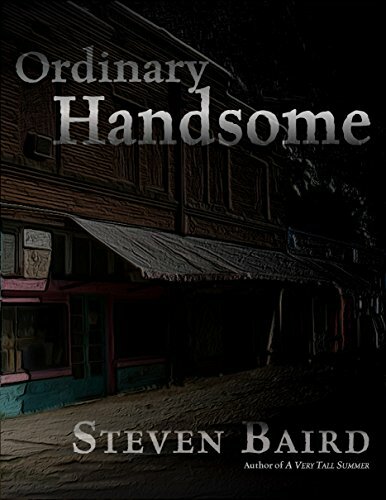 Excerpt from Ordinary Handsome. Available at http://www.amazon.com//dp/B00P46ZPA0 for only $2.99.